Happy Farmgirl Friday # 72 friends! It's good to have you here ( as always ) and your just in time for some fabulous farmgirl news. First of all, I'm excited to tell you that Mary Jane's new book Glamping with MaryJane is available for purchase as I type! I received my copy last week and I've hardly put it down. Need a winter project? Glamping with MaryJane covers everything from how to find and purchase your new/old glamper, clean her up, doll her up and have her road- ready by the time next years International Glamping Weekend arrives. Mark your Calenders for June 1-3 2013! 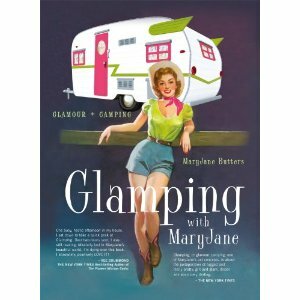 MaryJane leaves nothing untold about glamping! You'll even learn how to hitch her up so you can head out with your glamping buddies without a care in the world other than which table cloth you'll use when you set up " glamp "! If that isn't enough to get your farmgirl heart all a flutter...Dandelion House friend and sponsor FarmMade will be a guest at Luscher Farm's Open House 2012 sharing their mission of supporting farmers of all kinds! City, Suburban, Rural and more! If you are going to be in or near the Portland, Oregon area please stop in and say hello and tell em I sent you! Our FarmMade friends would LOVE to meet you! Luscher Farm is park and working urban farm located only 13 miles from downtown Portland, Oregon. Open to the public from dawn until dusk, visitors from other cities, states and countries travel to visit this unique farm year round. FarmMade is thrilled to have a booth at Luscher Farm's 2012 Open House. Read more about Luscher Farm here. Whew! Alright! Now it's time to link up for your weekly dose of farmgirl soul-food! You know what to do! Give us the goods! The FARM goods! Have a wonderful holiday weekend and best to all my mommies with getting your youngster's back to school! PS. If you find a quiet moment over the holiday weekend, come on by the MJFbeachfarmgirlblog for this weeks entry RISING TIDE! I'm sharing some special " creative " homeschooling memories! Dear Friends, old and NEW! WELCOME! I hope this note finds you all well and enjoying the slow turn of summer into fall. And, for those of you who have been dried out and puckered up by the drought I wish you RAIN! I know it's been tough on you and your gardens. We are only days away from a new school year and autumn is right around the corner, but summer is NOT over yet..It doesn't officially end until September 22nd the Autumn equinox. I don't need the calender to tell me that. My backyard blossoms are going strong and are sure to keep us in ' house flowers' for weeks to come! That means you'll be enjoying them too no matter what your weather is! 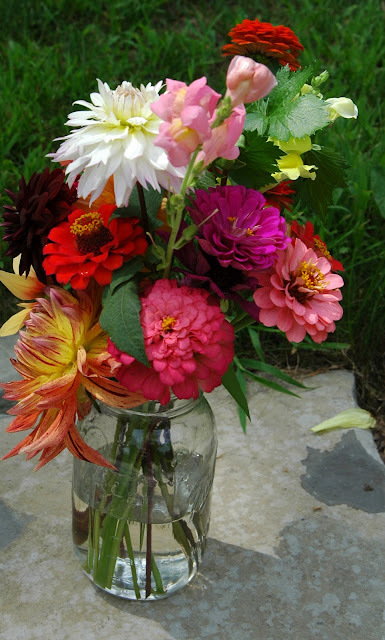 Today I'll show you what to do with a bucket of blooms! Start with sharp cutting tools. I use Fiskars pruners. I have two sizes. One for cutting larger stemmed flowers and shrubs and a smaller one for removing leaves and cutting the bottoms of stems before they go in a jar or vase. You'd be amazed at how many flowers you can fit into a full sized Ball Mason Jar. This bouquet is made up of a mix of dahlia,s zinnias, snapdragons and parsley for an added green filler. 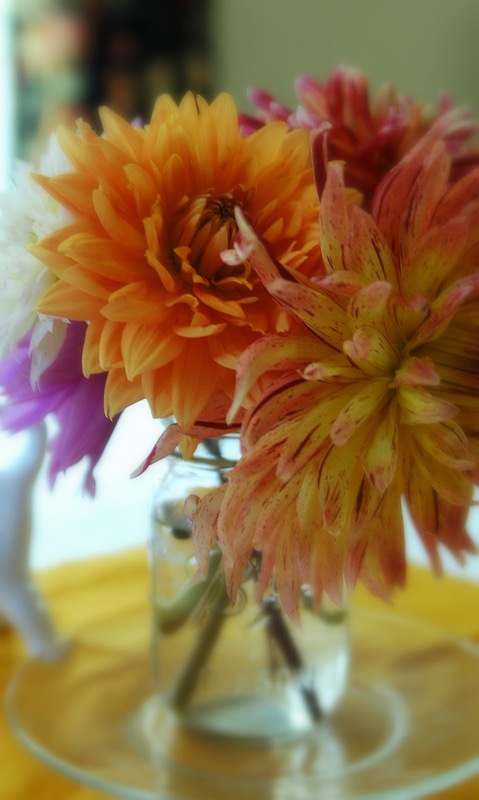 I love a bold color pallet and this deep red dahlia makes the mid toned orange dahlias go POP POP POP! Here I've added some pinks, and red oranges with one lovely white dahlia to set the whole thing off...Then came the remaining zinnias and snapdragons with a snip of parsley just for a touch of added greenery. Arranging flowers is a little like decorating.. I chose blooms that play well together then added a touch of whimsy just for fun. Notice how the deep red in the petals of the bottom left dahlia speak to the same red in the zinnia behind the maroon dahlia in the above photo? I repeated that same orange zinnia throughout and added the hot pink for a wow factor! The idea is not to be too serious ( get your play on ) and use what you have available in the garden! This is the beauty of growing sustainable cut flowers in your own backyard ( or front yard ). 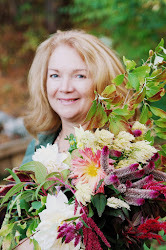 You'll get a less contrived look this way and feel good about creating something original with each bouquet you make! In the end, if it makes you smile you done good!!! With only a sprig or two of parsley as filler that leaves plenty of room for FLOWERS! Here it is finished and ready for any occasion inside or out! This beauty was destined for the counter by my kitchen sink where I seem to spend an inordinate amount of time! How do you like to arrange your " YARD FLOWERS" ? Down Home Blog Hop # 1 ! Sometimes simple is best. For this Simple Sunday centerpiece I gathered 5 dahlias, two large, one medium and two smaller sizes for a balanced arrangement. No fancy vase needed... I used a small mason jar. This is the perfect height for a dining table or kitchen island. Instead of peering through a taller arrangement while you converse this simple Sunday bouquet energizes the atmosphere but doesn't steal the show! This is the same arrangement from a different view point. * When arranging flowers for a centerpiece, all sides must be equally beautiful! 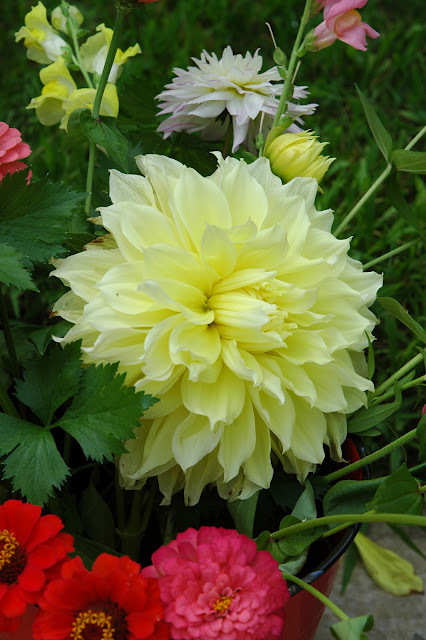 * When cutting flowers be sure to remove any foliage that will be below the water line to prevent bacteria growth. This will increase the vase life of your flowers. * Cut flowers in the early morning when possible. Cut stems at an angle and place them in cool water in a bucket or vase. Welcome back one and all to the Farmgirl Friday blog hop # 71! Your place to show and tell all about your farmgirl/boy talents and not feel the list bit like your braggin' at all! You are with friends who come here every week to learn and share the ups and downs of farming. It's not the size of your plot that counts, rather the creativity and farmgirl genius that matters most! I can feel the change in the air which tells me September is right around the corner. I'm ready, are you? Already I'm thinking of small changes I would like to make inside and projects that got left in the dust when spring arrived and planting started. But I'm keeping those a secret for now! Let's tale a peek in the garden shall we? The Pumpkin on a Stick I planted in the greenhouse ( and later transplanted ) has done wonderful. Just look at those tiny miniature pumpkins! They are already starting to turn the tiniest bit of orange. They'll add a great splash of color to fall flower arrangements! The tomatoes are beginning to ripen on the vine too. Cherry tomatoes for salads and a sweet pop em in your mouth snack, and brandy wine tomatoes just for slicing. YUM! It's like fourth of July in the Dahlia beds this week! The Dahlias continue to put on a an amazing show. Each week a new variety opens up...The colors just knock me out! I've been playing around with different bouquet arrangements which I'll share in a future post! For now, it's time to link up to your favorite Friday Blog hop for your weekly dose of farmgirl soul-food! Each week is such a treat! 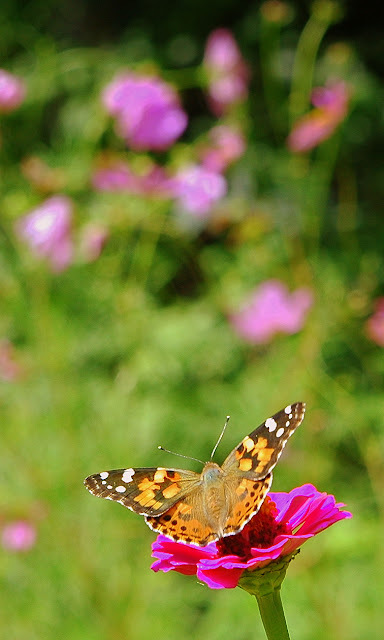 As we wind down the last weeks of summer our calender is still loose leaving plenty of time for backyard butterfly hunting and visiting with the " Cottage Hens". My MIL is limited to the things she can do at 90 but she's taking it in stride. She fell and broke her hip in January and has made a terrific recovery, but her eye sight is fair at best and she can be a little wobbly on her feet so she needs me to be nearby while we make our way around the flower beds. After we inspect the bees, blooms and butterflies we sit in the shade and treat ourselves to a Popsicle while we chat it up with the " girls " ... I cherish these moments, just she and I in the garden together. The other day while we were in the garden she told me this has been one of the best years of her life! I nearly cried...Me too Mum, me too, I said.. I guess the flowers have done their magic on her too! There are sweet moments to be had if you can slow down enough to enjoy them! I hope you too are able to find a moment or two to savor with a cherished loved one during these last few " slow summer days "
It is salve to the soul! No one was more surprised than I was when the monarch's, painted ladies and swallowtails started swarming our zinnia patch once they were in full bloom! I planted them for the soul purpose of cutting not knowing they would provide an all you can eat buffet for the butterflies this summer. What a joy it is watching them them flit and flutter from stem to stem. I've managed to capture a few in action this week between the raindrops! They don't seem to mind me ( the BIG shutter- fly ) stocking them for the perfect pose! Usually the butterfly traffic in our yard has slowed way down by this time of year, because the Butterfly Bush and Cone-flower in my perennial garden are well past their peak blooming time, but this year the ZINNIA DINER is open for business for a couple of more weeks I hope! This butterfly ( name unknown ) is unique. I've only seen it once! Another garden mystery to be solved! * Thank you Lisa Lynn for helping us find the name of this beauty! Welcome to the Farmgirl Friday blog hop # 70! WOW! Has it really been seventy weeks that we've been playing " farmgirl " show and tell? It's just wonderful and I thank you all for your great entries each week and your blogging loyalty! This weeks featured " farmgirl's " are of the kind of gals who have a special fondness for the days gone by when a woman wouldn't dream of starting a day of " skirt work" with out her trusty apron tied around her waist at the ready for what ever came her way. Whether she was knee deep in be flour dust, or berry stains, the lady of the house was always prepared, even pretty! 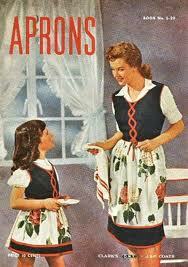 It must be time to GRAB YOUR APRONS at Heidi's place this week! She's hosting a show your colors apron party! 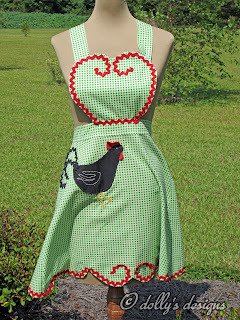 Are you a modern day farmgirl who likes a little farm flair design on her apron attire? 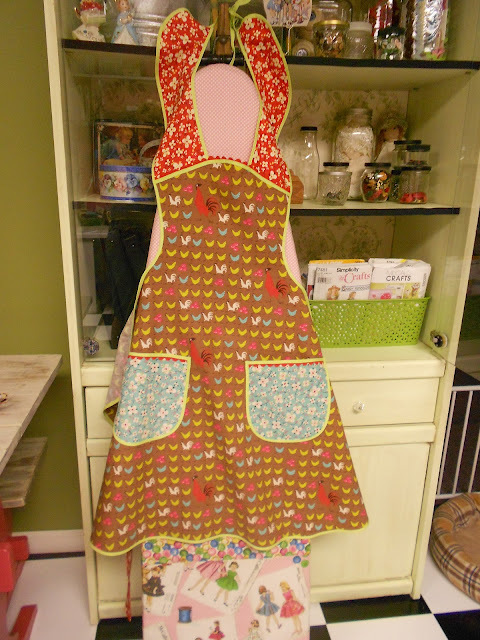 Check out Dolly's Rooster Apron! I love everything about this apron. The green and white check is the perfect foil for those darling the rick rack swirls and the handsome rooster so cleverly appliqued to the front. Next up is Taso of the Y Not Homestead...blog. Her charming ( not so demure ) apron is simply elegant with a splash of vintage bling! If you're a sentimental farmgirl you'll love the vintage aprons hanging on the line over at the Little Homestead on the Hill and the touching story that goes with them. And last but not certainly least. Sister Brenda of Ladybug Dreams whipped up an delightful little farmgirl style apron in her new craft room! I'd say her new space is filling her with plenty of inspiration for crafting aprons a plenty! I love the way she mixed different fabrics and the added details are the perfect touch! PS. Join me for a walk among the flowers on the MJF Beach Farmgirl blog! 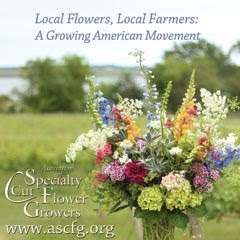 Growing flowers for the soul purpose of cutting them is a luxury for sure, but we gardeners/farmers know that isn't the only reason to nurture a blossoming flower patch. We do it to create memories. Memories for ourselves and each other. We do it to learn, share and grow deeper in love with the wonder of gardening. We want and need to be in awe of something greater than ourselves. We need to witness miracles, beauty and life to thrive. What better way than to get down and dirty with the ingredients nature gave us and go to work! I have you to thank my dear blogging friends for an idea that woke me up bright and early this morning! I've noticed with each flower post I do, many of you share a ' flower story or memory " with me in the comments section. 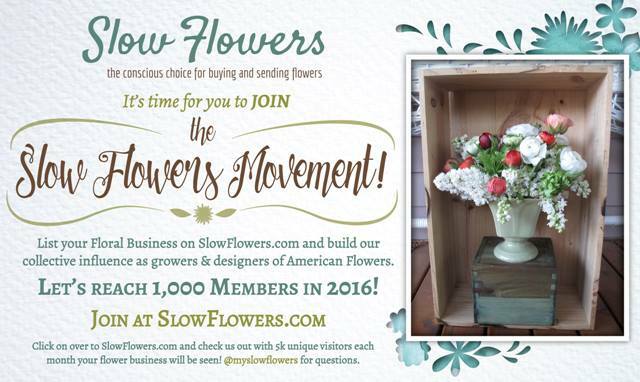 YARD FLOWERS and GARDEN MEMORIES for the BUDDING flower lover in you. or a three page story I invite you to share them all! What better way to bring a photo to life than a story to go with it? 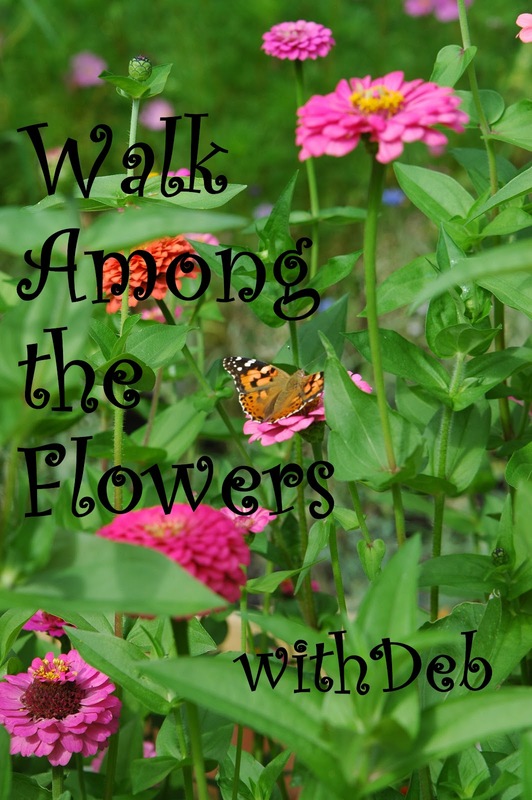 I'll be featuring common old fashioned/ heirloom flowers and shrubs in my book such as: Forsythia, Lilac, Cosmos, Zinnias, Oriental Lilly's, Sunflowers, Tiger Lilly's, Hollyhocks, Hydrangea, Dahlias, Delphinium, Black Eyed Susan's, Shasta Daisies, Cone Flower, Bachelor Buttons, Egg Plant on a Stick, Phlox, Nasturtium, Clematis, Day Lilly's and more! Let's get more ideas sprouting! 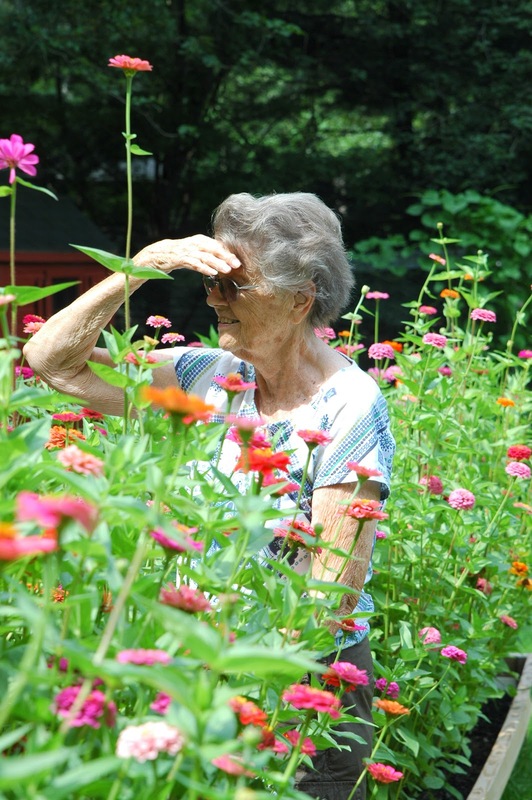 Share your garden memories too! All stories will be considered for possible contributions to my book! Thank you for all the inspiration and support! 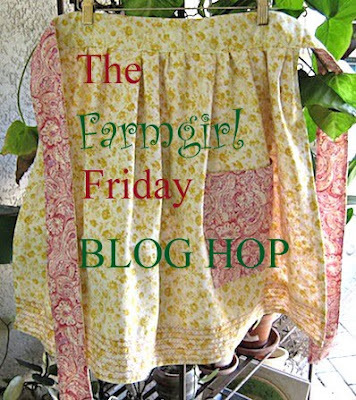 Welcome back to the Farmgirl Friday blog hop. If you're new and this is your first time visiting make yourself comfy. You're among friends. Warm and generous Farmgirl Friends who love to gather together to toot their own horns about the things they've been up too all week whether it be in the kitchen or out in the chicken coop or craft room, studio or study, sewing room, greenhouse or garden house! Fridays are for Farmgirls ( as my co-host Heidi says ) but before we hop I have something very meaningful to share with you! I ordered myself a little ' farmgirl bling' before we went away just so I would have something fun to come home to! Many of you know about MaryJanesFarm Farmgirl Sisterhood ( if not, I'm honored to introduce you! ) Once you've joined the first thing you receive is your sisterhood number. I'm sister # 1199! Then you can order your very own Farmgirl Charm Necklace too! This two sided charm hangs close to your heart on an 18 inch chain. I have to admit, I felt a touch giddy when I first put mine on...Cuz I know I'm not the only one who feels that way! These lovely necklaces are created for MaryJanesFarm by Elaine Tolson of Living A Charmed Life blog. Each charm contains that magical spark of MaryjanesFarm that we all felt the first time we laid eyes on her magazine or one of her fabulous ' Life Books'. Once you are an official member you'll receive monthly alerts for sisterhood special discounts, plus the monthly newsletter delivered via PDF which is every bit as charming as the magazine. It's called " The Cluck "! Read sister Dolly's Spotlight on Elaine Tolson here. And, be sure to go check out the other links in this post to learn more about MJF and the sisterhood! Time to strut your stuff farmgirls!! !